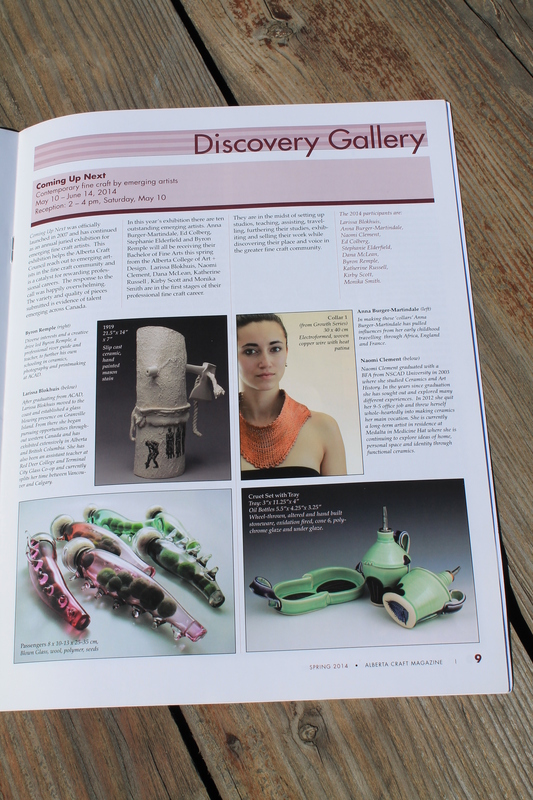 If you’re going to be in the Edmonton area any time between May 10 – June 14, you can see some of my newest work in the Alberta Craft Council’s Discovery Gallery in the show Coming Up Next: An Exhibition of Contemporary Fine Craft by Emerging Artists. Or, if you have a copy of the Spring 2014 issue of Alberta Craft, you can see some of the pieces that will be in the show on page 9. This entry was posted in News and tagged Alberta Craft Council, Discovery Gallery, Emerging Artists, naomi clement by naomiclementpotter. Bookmark the permalink.